After having an interview at S.H.I.E.LD in Hereford; Darcy had decided to leave New Mexico and she started to head off to London England and begin her new life there. She bought a apartment and she decided to live there so she could be closer to her aunt. She was very close to her and she hoped she could visit her more often. Once entering her new found home; Darcy placed her hands on a box. "Alright... lets get started with unpacking shall we?" she stated to herself. She started to organize her apartment and she figured out where to place everything. She loved being on her own; And she knew she could always go to work in Hereford; she wasn't that far. Hours past as she continued to do her setting up in her apartment. Once it was done; Darcy finally managed to lay on the couch. With a groan she curled up and she took a nap. Soon she covered her eyes with her arm and she sighed. Moments passed and she looked over at the Taser the company gave her. A smirk came to her and she started to try to figure out how to work it. She sat at the couch and she looked at it for several moments. It was no secret to the trickster that his brother favoured the mortals. And some mortals above others. Such as Jane, Selvig and Darcy. He had already gotten to Selvig. Jane he was saving for later (he couldn't risk being found out and dealing with his brother is he played around with her) and that left Darcy on his list of people to mess around with. And as Loki had basically infiltrated SHIELD, he had managed to find out where she was. So he he turned at the door of the apartment, carrying a bottle of champagne (he had been planning on mead but this would just make things too obvious). 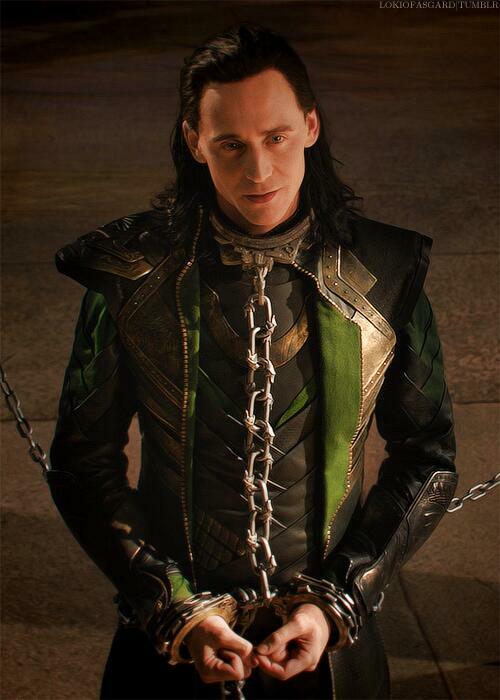 He wore a form that he had used in Asgard. A male, similar build to him, with short ginger hair and bright blue eyes. It had fooled Sif. This mortal had never met him in person, it would fool her. The game he was to play was that of the friendly neighbour welcoming the new guy, or girl in this place. He had found out that this was one of those strange things that mortals did. But it gave him a nice little place to sneak in today. Standing at the door, he put a friendly smile on his face and knocked on the door before standing patiently, waiting for her to answer. This should be fun. Silence was within the apartment. Darcy had been staring at her taser for a good five minutes now examining all the buttons and wondering what they did. Soon she got up and she went to make something to eat for herself. She loved coming to England to visit her aunt. She also had another home in New Mexico. Hence why she only had an apartment here. After her food was gone; she was about to sit on her couch again when she heard a knock at the door and she blinked. "Wonder who that could be.." she muttered to herself. Placing the taser down she headed towards the door and peeked into the peep hole and opened it. Blinking she stared at the man who stood before her. "Hello? May I help you?" she asked staring upon the man who was at her door. Darcy stared at him through her glasses and she remained silent. She remained silent as she kept where she was and she looked at him still. Wondering who he was. Looking at the woman who had answered the door, his eyes took a quick scan of her figure, considering what she looked like, putting this figure into his mind. This was Darcy. The assistant to Jane Foster, the woman that seemed to have captured his brother's heart. Getting his own back against his brother. "You won't know me. I'm one of your new neighbours. I thought I might bring you a welcoming gift," He said, holding up the bottle of champagne that he had brought and a friendly smile on his face as he stood there, with a slight angle, appearing to be relaxed and open. He would not let her know who he actually was or the danger that she was technically in, considering his plans. "I hope you don't mind me coming over, I just wanted to try and make a good impression," He said, attempting to get more of a conversation going. He wanted to know what he could about this mortal and he wanted to be able to use her to get to his brother. He never kept to an absence of plan. There was always a scheme going on in his mind. Remaining where she was Darcy stared at the orange haired male that stood before her. Staring over at his hand that had champagne in it; she grinned a bit. He was nice; Handsome that was for sure. Darcy stood back and she smiled. "Well its nice to meet you!" she said to him. "Please come inside" she told him in a soft voice. "Oh, No of course not! I like company" she told him. "You know; I haven't had many welcoming visitors yet. I 've come here before to visit my Aunt time to time when I'm not working; " she explained. Closing the door behind him and she placed her hands on her hips and she looked at him a little more. Darcy walked into the kitchen and she went on her toes to get two glasses. "Sorry I don't have any champagne glasses yet... " she said biting her lip. "I've yet to get a few things to put in the cabinets. This is all I have for these glasses" she told him. "Forgive me; I'm Darcy and yourself?" she asked looking at him sticking her hand out for him to shake. She loved meeting new people. As he expected, it was not hard to gain access to the woman's home. He only had to bring some alcohol and lie, saying he was a neighbour. Although, most mortals didn't expect someone to lie about that, he suspected. Tough for them. They should be more wary. Especially if they had any loose link to him. A pleasant smile remained on his face as he was invited in. Courtesy was important, as was etiquette and he wiped his shoes against the mat to remove any signs of mud (there was any but he trusted the gesture would be well received) and he held the champagne bottle lightly, ready to hand it over at a moment's notice. And, it was probably worth noting that he had not poisoned the liquor. It was freshly stolen from some well-to-do supplier of such finesses. Norns forbid the prince (and future King!) offer and partake in anything less than the finest. "Thank you," He said, dipping his head and entering the building. It was always pleasant to be invited into the enemies home. Especially when they were in beautiful ignorance. This feeling was more potent than any mortal alcohol would ever be for the trickster's system. The adrenaline of the lies. Well, there was a reason that lying and trickery were his arts. "You've been here before? I must appologise for not greeting you earlier, even if your earlier visits were only to spend time with your Aunt." He said, playing the part of the friendly neighbour. Poor mortal had no idea what company she was in. Well. He would have his fun with her. It was already proving to be so promising. As she brought out the glasses, he examined them and knew them not to be the traditional glasses for the drink he had brought. Darcy admitted that as well. "No champagne glasses? I wonder how you cope," He said with obvious humour in his voice that he was keeping soft as silk. The woman introduced herself and his lips almost twitched in a smile. He had already known her name but his expression remained neutral as he took her hand. "Pleasure to meet you Darcy. I should have introduced myself earlier. My name is Lucas." He said, tempted to add in a surname to strengthen things but he decided against it. No need to seem too formal. After he came in she smiled and she nodded her head in response. "You're welcome!" she said in a cheery voice. Darcy loved meeting new people weather it be an adult or a child; she still was a very sociable person and she was also a very hard worker. Darcy entered the kitchen and she chuckled a bit hearing his words shaking her head a bit. "Well they haven't come yet from where I originally came from. Which was the United States" she stated to him. Darcy was here to work and to visit her aunt from time to time when she wasn't busy. Hearing tae two cups cling; she looked at him and chuckled a bit. "Oh Psh, don't worry about it. She understands i have work to do as well; and I can go see her at night or during the weekends when I'm not so busy" she said smiling coming over to him and setting the cups on the counter in front of him. "The pleasure is all mine Lucas" she said staring into his eyes. This man was rather interesting; and she said nothing keeping silent and remaining where she was. "So, where do you hail from Lucas? Do you do any sort of job?" she asked quirking a brow at him. Darcy chuckled and she shook her head. "They shall be here within a few weeks" she told him giving a small smile.